Cavacas is a popover style Portuguese pastry. 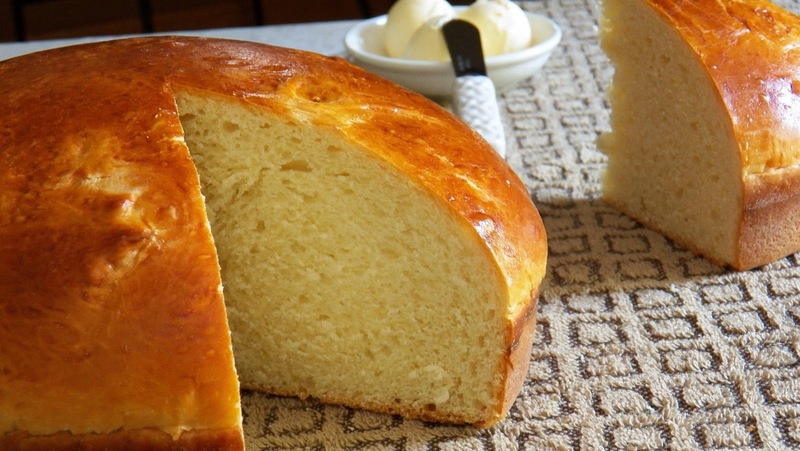 The dough is light and airy and the glaze has a hint of lemon. Delicious! The picture makes it look like I know what I’m doing, right? Well, before I was able to achieve competency, I achieved utter failure. In this very spot is supposed to be a picture of my first batch of copycat Cavacas to showcase the catastrophic result for your amusement. Unfortunately, I accidentally deleted the photo from my camera. Believe me, it looked nothing like the picture above. In fact, it resembled one sloppy mass of pancakes or as I would call "culinary roadkill". I tried these sweets for the first time recently. My friend Ria brought Cavacas when she and her husband came for a visit. They always arrive armed with deliciousness from the Portuguese bakery. This delightful pastry was among the bounty. It was crusty and sweet on the outside, soft, eggy, and air-pocket-filled on the inside. Needless to say, right up my alley. Since there are no Portuguese bakeries to be found near me (just as well because I would make way too many frequent visits), I set out to make my own Cavacas. My first instinct was to recreate it using French choux pastry, but yours truly didn't follow the directions carefully and ended up with a mess. Ria, who from this point on will also be known as a fellow avid baker and lover of all things delicious, graciously gave me the recipe when she heard about my desire to make the pastries. Is she a great friend or what? Thanks Ria! You’re the best! Did I mention that she is also a great hostess who can put together a dinner party like nobody's business? Anyway, after seeing the authentic recipe, it was clear that Cavacas are made more in the manner of popovers than choux pastry, therefore a bit easier to make than I thought. Just beware that there are a whole lottta eggs and a whole lotta mixin’. Thank goodness for stand mixers! To make, just put all the ingredients into the bowl. Mix away for at least 20 minutes. Fill greased muffin tins or popover pans halfway with batter. They come out of the oven looking like this! How cool is that? Update: I finally found out the recipe's creator. Thank you Maria Lawton, the author of Azorean Cooking for a wonderful recipe. Grease standard size muffin tins or popover tins. Using an electric mixer or stand mixer (on level 6) beat all ingredients for at least 20 minutes without stopping. Fill the muffin or popover tins no more than half way. Place on the middle rack. For moist Cavacas, bake for about 45 minutes; for dry Cavacas bake for 1 hour. Combine all of the glaze ingredients and stir until smooth. I tend to use slightly more than 2 tablespoons milk. 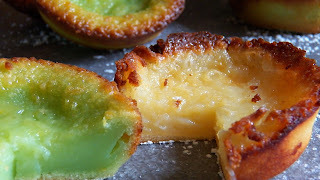 While Cavacas are still warm, spoon the glaze over each one or just submerge each one in the glaze. Serve on the same day since they will dry even more for the following day. The cavacas that I have experienced are not shaped like you have. I have had them shaped like a bowl and I have had some shaped like a flat oval.I would assume it is all done with the same recipe, but not done in a muffin pan. Any thoughts on getting any of these other shapes? Cavacas are commonly known as Portuguese Popovers because they are often baked in popover pans or muffin pans. The ones that my friend gets from the bakery are coned shaped because I think they are baked in a deep popover pans. To answer your question, I think the shape of the pastry just depends on the shape of the vessel they are baked in, so an oval one might be baked in an oval mold or ramekin. I also think the amount of batter in the mold affects its final shape, although the is just an educated guess...I have not tested it out. My mother made these and she used little individual pie tins. They are call cavacas or carolinas, working as a baker in a Portuguese bakery, they are molded with a pastry bag into little ball that puffs in the oven. Carolinas or cavacas are a modify pate a choux, the difference is that, pate a choux we boil water with butter or margarine, add the flour and mixed well until a dough is formed, then we put it in the mixer bowl add the eggs and we have either one of them. I have made these several times and they always turn out perfect, I think the trick is to put the batter half way. Those look delicious!! I'd love to try them. You should have seen my catastrophic dinner last week. It came out delicious, but looked horrible. LOL Thanks for linking them up with us at Foodie Fridays! Ha ha!! We all had our share of those meals! But when it tastes good, nobody really cares how looks, right? What a wonderful treat, wish I had one with my afternoon tea. Hope you are having a great day and thanks so much for sharing this awesome post with Full Plate Thursday. Thank you! I like that the mixer does all of the work for you. Have a great week! They look so similar to Yorkshire puddings, but for those you need more oil. I would like to try these. These have a little more of a chew then Yorkshire pudding, but they are so good! I hope you'll try them! !